Welcome to the RMC site! Bookmark this page to stay up-to-date on the latest doings of your CWA RMC. As Council members, we may be retired but we remain active in the life of our union. Because of the steady erosion in the retirement security of most Americans, we believe it's essential that we actively participate in the struggle to protect our benefits. 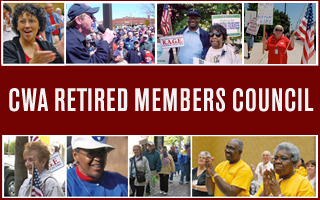 Through the Council, CWA retirees have input into key retiree programs as they are shaped through contract negotiations and or legislation. We monitor federal, state and local politicans and legislation in support of our goals and interests. Join us. Click here to become a lifetime member. Former CWA President Morty Bahr was honored with a Lifetime Achievement Award by the Elderly Housing Development & Operations Corporation. CWAers and retirees have been participating in nonviolent direct actions to fight back against the structures that are undermining our democracy and supporting economic injustice.